Petero Ratumaitavuki, Tavua Districts Secondary School U19 Rugby League Captain. “When I think about Mangroves, I think about all the delicious crab dishes of lairo, qari, and kuka that my family used to eat,” 19 year old Petero Ratumaitavuki said. 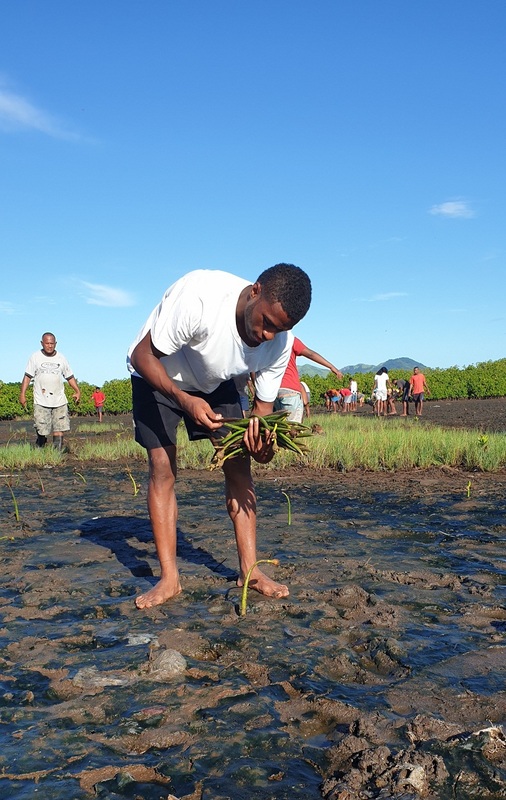 Mr Ratumaitavuki is the captain of Tavua District Secondary School U19 Rugby League team who planted more than 2,500 mangrove seedlings early Saturday morning of the 16th of March, 2019 in partnership with Tikina Tavua and WWF-Pacific. While many school students from around the world boycotted classes to demand for action on Climate Change, Mr. Ratumaitavuki and his team mates, supporters and teachers of Tavua District Secondary School decided to take action to fight climate change by planting mangroves as part of the “Living with Change, Resilient Mangroves, Fisheries and People of Fiji and PNG project,” which is funded by the German government and facilitated by WWF-Pacific. For the first time ever, Tavua District Secondary School’s Under19 rugby league team had made it into the national quarterfinals and Mr. Ratumaitavuki thinks that the team has a responsibility to the rest of the school by demonstrating good leadership and sportsmanship. 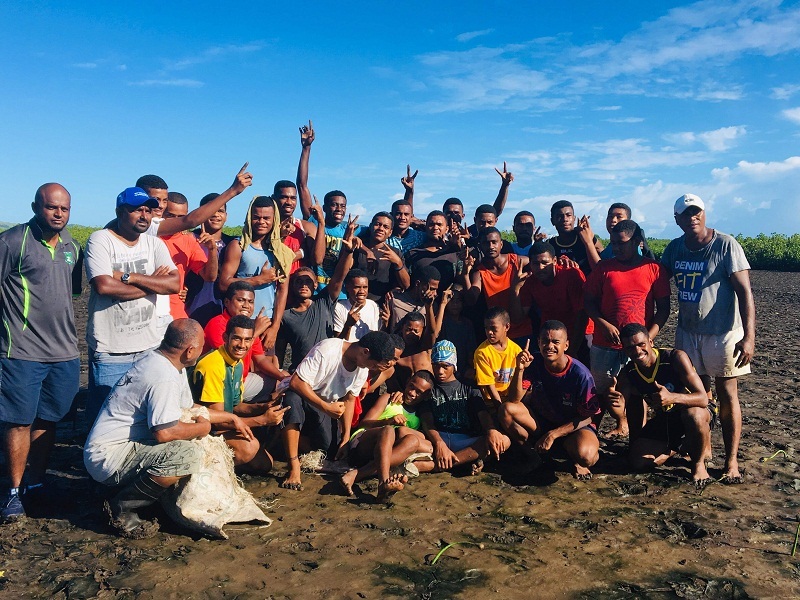 To celebrate this achievement and to give back to the school and their community, the U19 team together with its supporters agreed to host a mangrove replanting programme in Tavua. “I believe it is our responsibility to demonstrate and create awareness that mangroves are so important to our lives and towards fighting climate change and the best way to do that is to support our district protect, and re-plant our mangrove forests, ” said Mr. Ratumaitavuki. “Planting mangrove seedlings today reminded and reaffirmed what I learnt in my science classes that mangroves helps to fight climate change, stop coastal erosion, cleans the water and most importantly provide us with food and income,” he added. Ratumaitavuki further said that his team will continue to champion the important message of protecting mangroves for a better future amongst his fellow school mates and his community. He believes that if they do not take action to protect and save their mangrove ecosystems then future generations will not be able to enjoy the delicious crab dishes that he currently enjoys. Mr. Apolosa Robaigau , WWF-Pacific’s Climate Change Field Officer said that it’s encouraging to see secondary school sports teams actively involved in activities that protect their natural resources which underpins sustainable development, climate change adaptation and mitigation and calls on all schools to follow the great example and leadership of Tavua District Secondary School U19 Rugby league team. Miss Akanisi Lomaloma, Fiji National Rugby League Events Coordinator congratulated Tavua District Secondary School U19 team in making to the national quarter finals and commended them on their efforts to protect and save their mangroves. “Tavua District Secondary School U19 team is a new comer to the national quarter finals showing commitment and dedication throughout the playoffs and it is great to see them celebrate and give back to their community through mangrove replanting – an initiative that FNRL fully supports and promotes,” Miss Lomaloma said. The Secondary School Under19 Rugby League Quarter Finals will be played in Garvey Park in Tavua on Saturday the 23rd of March, 2019. Petero Ratumaitavuki supporting the mangrove replanting initiative in Tavua. 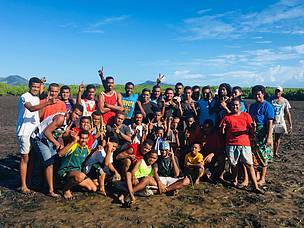 Tavua District Secondary School U19 Rugby League team pose for a group photo after the mangrove replanting. Group supporters join the Tavua District Secondary School U19 Rugby League team for a group photo after the mangrove replanting exercise.